Until I moved to California from England, my experience of tacos was very limited and I’d never heard of taco night. Like most Brits, I had memories of those dusty boxes of crunchy Old El Paso tacos, stuffed with minced beef and topped with loads of cheddar cheese. Not good. My first taste of a proper taco in California was a revelation. I spent my time living there trying all the different combinations on offer – from fish tacos at stoner-staffed surf shacks, to organic Korean tacos at hipster street food trucks, to old school taco stands at the side of the road – where my eating companions were the local Mexican farmers and farm workers. I picked up ideas from all of them and started making tacos at home regularly. Taco night in our house usually involves me rummaging through the fridge for goodies (aka leftovers), making a few things fresh then putting them in little bowls and letting everyone make their own tacos. This has been a great way for getting my boys to experiment with new foods as there is something about them making their own taco that makes them braver. In California, tacos are pretty much always served soft and are usually made with corn rather than wheat. In the US you can pick up fresh corn tortillas at any good grocery store (just be sure to buy non GMO). In England we can’t get them easily yet but lets start asking our supermarkets to stock them please!. You will see old el paso corn tortillas at the supermarket but they are frankly nasty and full of weird ingredients. They taste nothing like the real thing so avoid them. In the UK, you have the choice to either buy corn tortillas online and freeze whatever you don’t need straight away. Or make your own corn tortillas (the recipe is below). 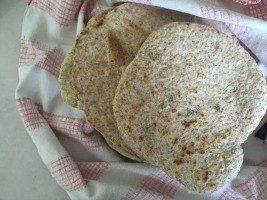 Or do what I do most of the time which is make my own quick wholemeal flour tortillas. Or buy flour tortillas or wholegrain wraps. The M&S mini tortillas are good and freeze well so you can stock up. Whichever tortillas you buy, they will need to be heated for your tacos. I usually heat mine one by one in a dry frying pan for a minute on each side and then wrap them in a clean tea towel or foil to keep them warm and soft until we’re ready to eat them. This is the most useful step by step recipe I’ve found. Masa Harina is a special type of flour made from cooked corn kernels that are soaked in limewater (which changes the corn’s nutritional structure and texture) before they are ground into flour. Don’t be tempted to substitute polenta or cornmeal as you won’t get the right consistency and your tortillas will crumble. You’ll need to buy masa harina online in the UK. It is available from Mexican food stores and Whole Foods in the US. Salmon or cod (dusted in ground cumin and dried oregano, pan fried or baked then flaked – or cheat and buy hot smoked salmon) with warmed corn, homemade salsa, shredded cabbage and plain yoghurt. Canned black beans (drained and quickly fried with garlic and chipotle chili sauce then mashed and finished with salt and a squeeze of lime) with corn, chopped tomatoes, sliced spring onion, feta and avocado. 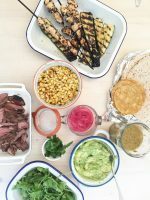 Steak (pan-fried until rare then rested for a few minutes before slicing finely) with shredded lime and salt-dressed white cabbage, roasted or bbq corn, avocado and salsa. Leftover braised beef, pork or roast chicken (reheated and shredded) with roasted carrots, raw finely sliced fennel dressed in lime juice; and rocket. Chicken thigh (dusted in smoked paprika and sea salt then pan fried, rested and thinly sliced) with avocado, roast butternut squash or carrot, toasted pumpkin seeds and plain yoghurt. Chorizo or sausage (thinly sliced and fried with red peppers) with rocket, halved baby tomatoes and avocado. Pan fried garlic prawns with shredded raw fennel and white cabbage, squashed baby tomatoes, avocado and homemade salsa. I top all these with a final squeeze of lime, some chili sauce and a sprinkle of chopped coriander. 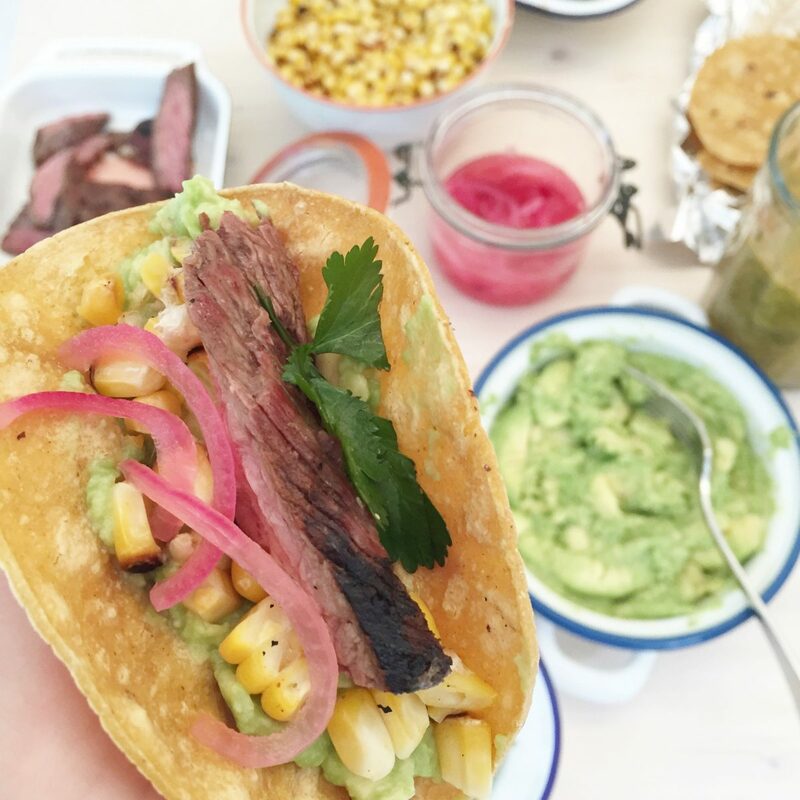 Find more recipes for tacos, variations and mid week meals here.